The village of Povoação is located on the Archipelago of the Azores, on the southern edge of the island of S. Miguel. Protected from the sea by a slope, the building is going to occupy a plot comprised of a flat, rectangular platform already prepared and used by the Municipal Council for other outdoor sports activities. This platform was achieved by «sacrificing» the slope, imposing a cut that distorts its natural volume. The project takes advantage of the existing cut to construct the building along its length, seeking a «fusion» between the new construction and the surrounding landscape. Its volume is fragmented and «runs», forming masses of black basalt, which correspond to the various functional groups of the programme. The coverings are «contaminated» by the green of the surrounding fields, punctuated by skylights, which ensure natural lighting of the interior spaces. A square of basalt gives physical support to the building, defining courses and accesses around an Araucaria, whose verticality and symbolic load announce and upgrade this new public space. 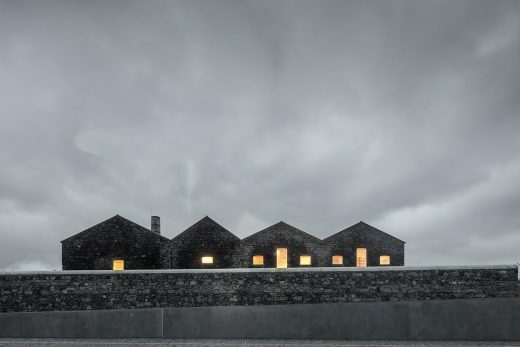 Inside, the programme is organised from the competition and training tanks, maintaining basalt as the dominant element in the entire composition. On the upper floor, an outdoor esplanade supporting the bar looks out to sea.